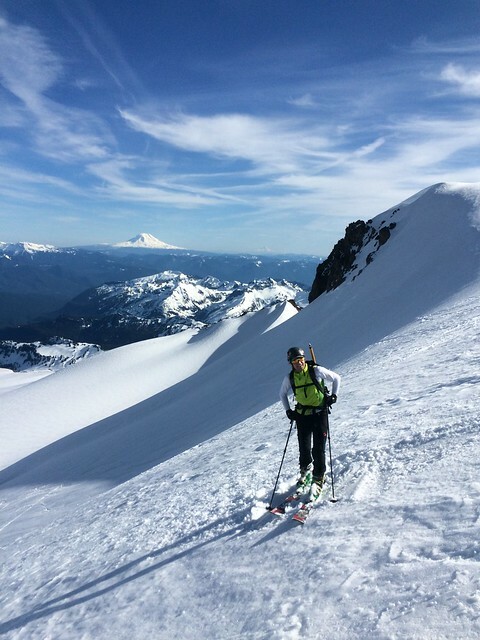 With a forecast calling for an early preview of summer, Andrew, Elliott, and I decided to take advantage and ski Little Tahoma on Sunday. We made it to Paradise around 8:30, and were soon walking down to Fourth Crossing to start the tour. Unfortunately for us, I had been to Cowlitz Rocks once before and we had started at 4th crossing on that trip, so I opted to repeat that same route. It was only later that we realized how easy it would have been to skin up to Golden Gate and cross over to the Cowlitz there. Oh well, what’s an extra couple hundred feet of vert on top of the 7k+ we were planning on? The skin up to Mazama Ridge was firm but easy, and we made great time up to Cowlitz Rocks, arriving around 10:15. 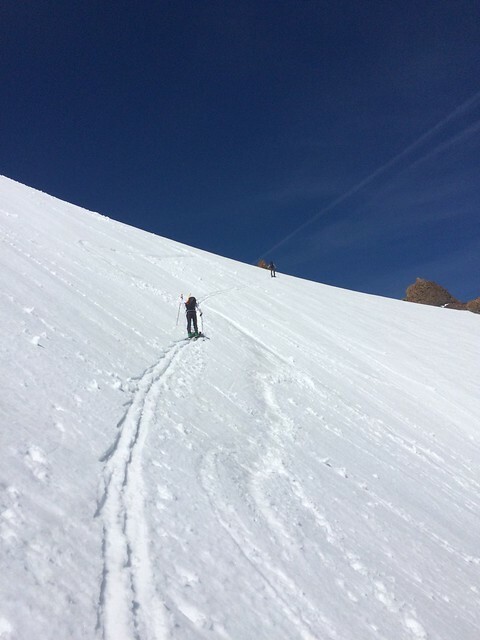 After a quick transition we were skiing down the already very soft snow towards the toes of the Whitman. We contoured across the moraine at around 6300 ft and we easily found steep but straightforward gullies to ascend. Elliott was leading this section and made the decision that switchbacks were lame, so I got to use the highest risers on my bindings for more time than I have during the rest of the season combined. 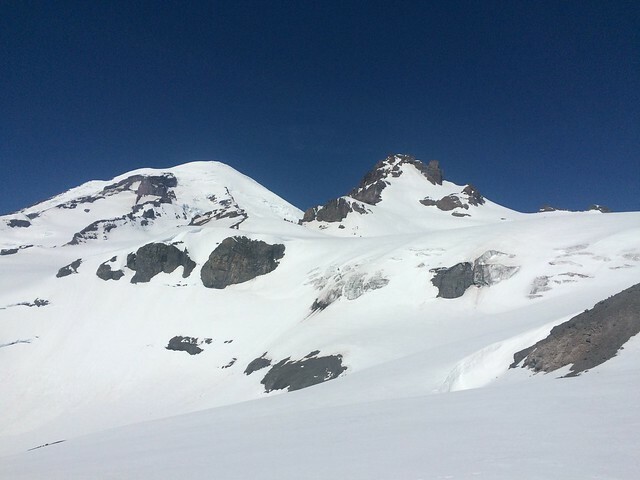 Around 12:00, we crested a small moraine and stood at the base of the expansive Whitman Glacier with a clear view of Little T and Big T.
The view from Cowlitz Rocks saddle. Cathedral rock in the foreground, Little T in the back. 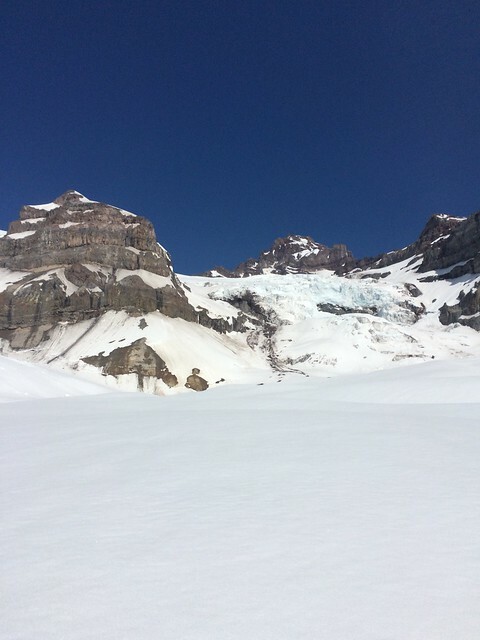 The view of Cathedral Rocks during the crossing of the Cowlitz Glacier. 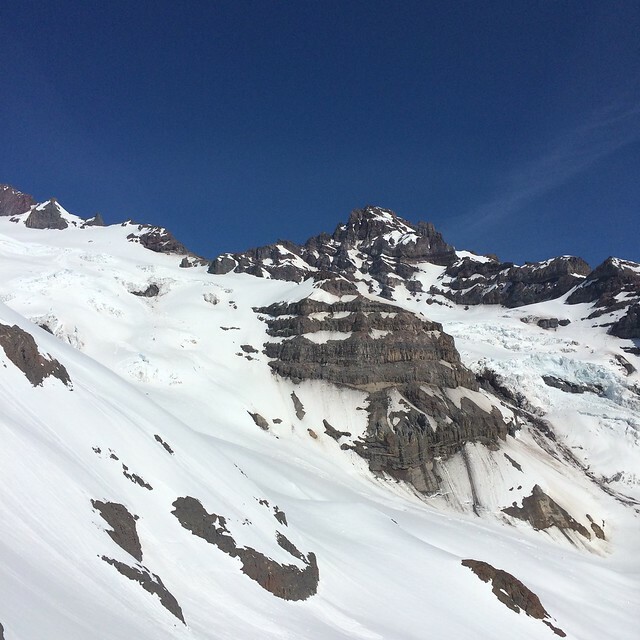 Looking up the Whitman Glacier. 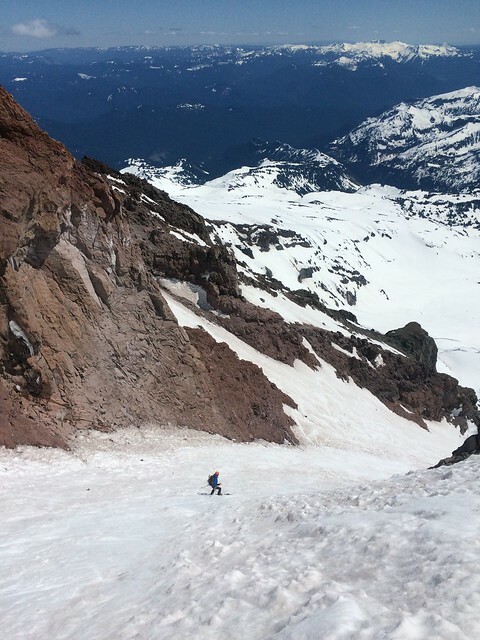 The route goes out of picture to the right and ascends the large snowfield on Little Tahoma. 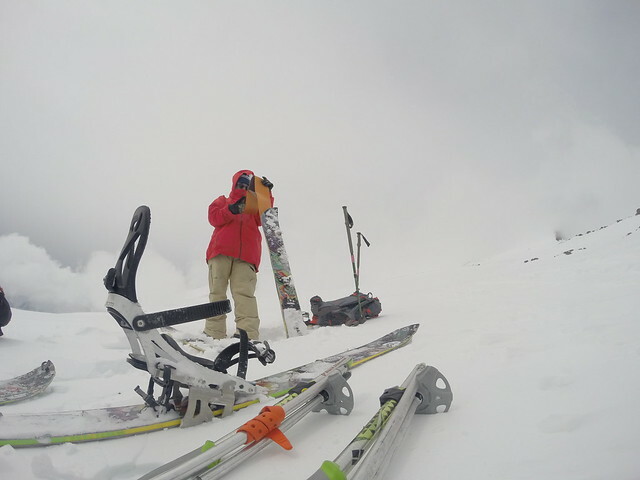 The next 1500 ft section was one of the more enjoyable stretches of skinning I’ve ever had. Easy rolling terrain, incredible views, and a light breeze to keep you just cool enough made a great combination. Soon enough we were at the base of the steep headwall of the Whitman. We skinned as high as we could, up to about 10,600 ft, and then booted up to about 10,800 where we stashed our skis and some extra gear. Another 100 ft of booting led to a short rock step with one tricky move, although trying to avoid kicking rocks down on your partners makes even the simple moves tricky. 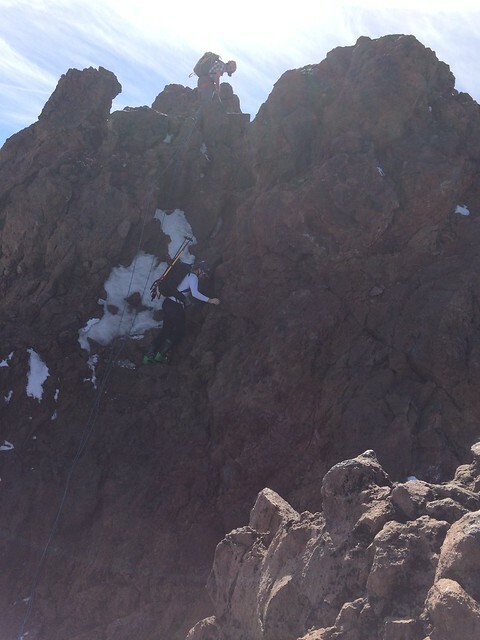 One more short section of snow led to fun, albeit rotten, rock scrambling up the summit ridge. 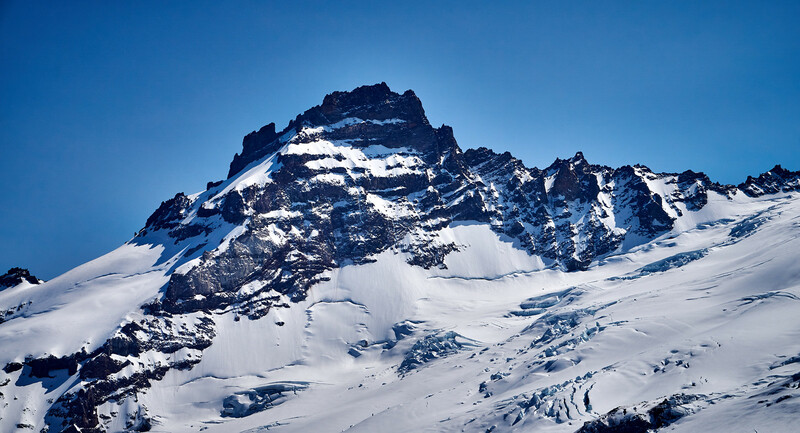 The first view over to the North side of the ridge will certainly get your attention – both for its beauty and exposure. 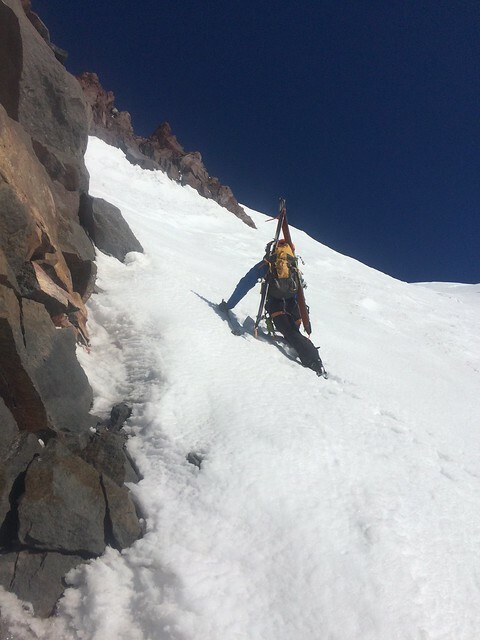 Once on the ridge, a short (~25 feet) traverse got us to the true summit block a little before 4:00. 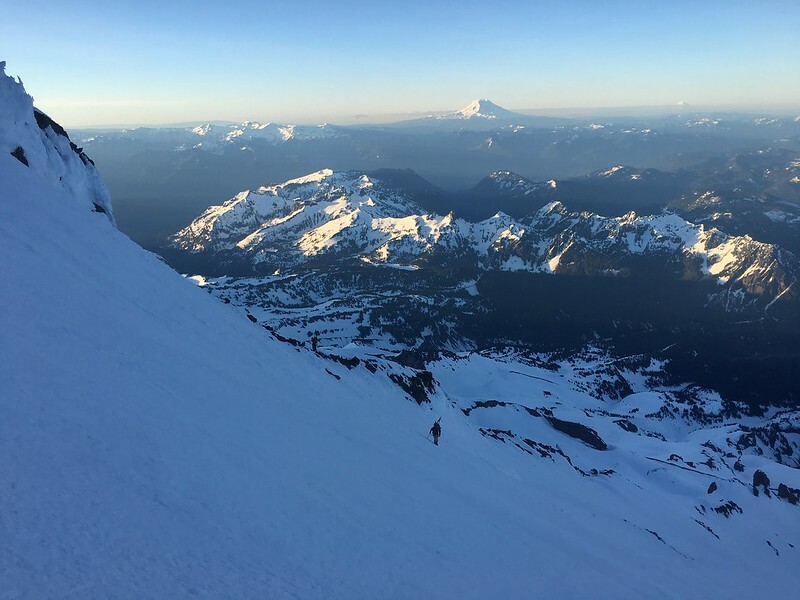 While the scrambling up to the ridge and the traverse to the true summit are exhilarating, Andrew and I both felt comfortable climbing and down-climbing in ski boots. Our last bit of skinning before switching to booting. Andrew downclimbing the traverse to the summit block. Another party chose to rap down to the snowfield rather than downclimb. The timing was the same either way. 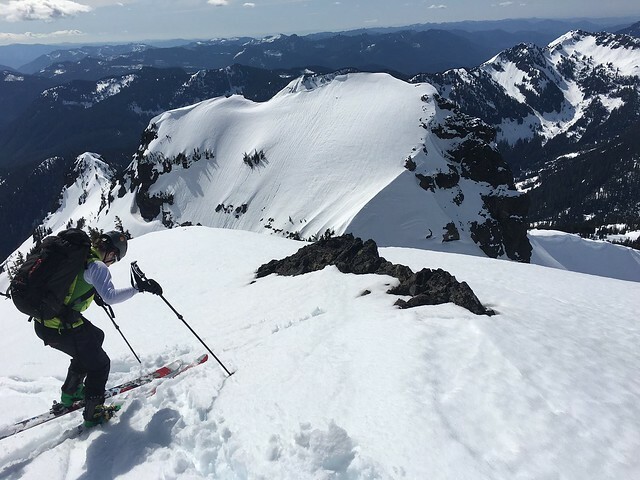 All that was left was a short boot down to our skis, 4300 feet of incredible corn skiing, 900 ft of skinning back to the Cowlitz Rocks saddle, and a leg-piercing descent/traverse to Golden Gate by 6:30. This tour makes for a long day but the scenery and fun scrambling at the top are definitely worth the effort. Andrew and Mt. Adams after the incredible corn skiing. Unicorn Peak would fit the criteria. 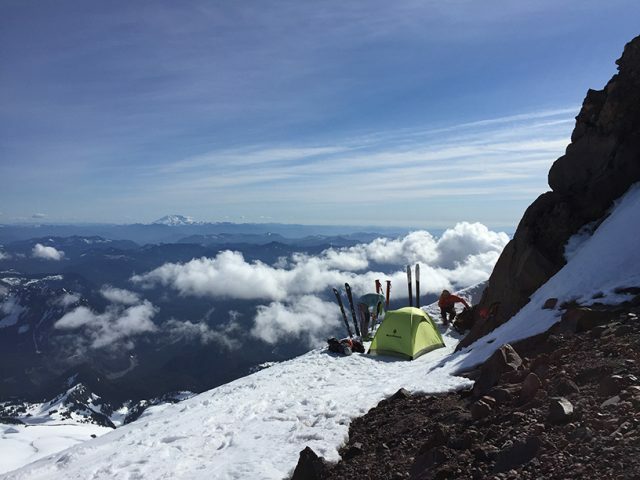 The largest mountain in the Tatoosh Range is just a stone’s throw from Mount Rainier. It has great road access, good vertical for skiing, and a summit block that would help shake off the climbing rust. We left Seattle at 6:30 AM and arrived at the parking lot (Narada Falls) at 9:00 AM and started our tour along Stevens Canyon Road. It is mostly flat as you pass some lakes on the left (Reflection, Louise) and the turnoffs for Castle and Pinnacle Peak on the right. After 2 miles on the road you will get your first view of the objective – Unicorn Peak. After 3.5 miles on Stevens Canyon Road, we picked up the Snow Lake Trail. 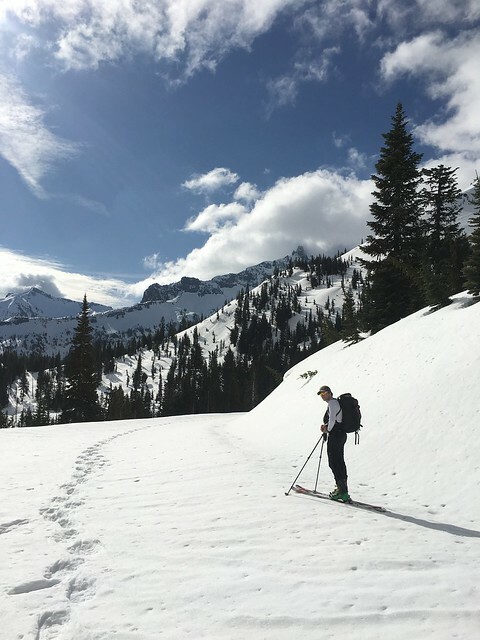 The Snow Lake Trail took us to… Snow Lake, at which point we observed significant wet-loose activity from the previous week’s warming trend. Be careful here as there are slide paths all around the lake; I would caution against coming here with any major instability in the snow pack. At this point the route becomes fairly straight-forward. 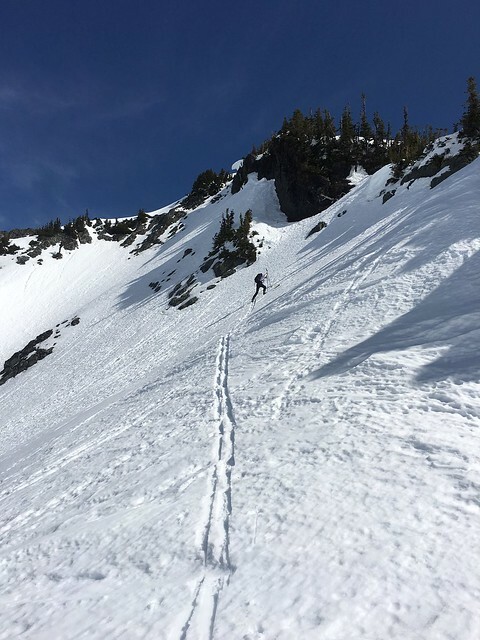 We headed toward the gully above the lake, which spits out into a breathtaking ski bowl with 180 degrees of good skiing aspects. Shot on time, we then moved east toward the saddle between Unicorn and the unnamed summit to the southwest. The top of this is the steepest section of the tour; thankfully we had Andrew to lay it down. Dude is a hoss. Once we topped out on the saddle, it was a ridge walk to the Unicorn summit block. At this point we got the rock gear out and made for the true summit. We took the direct 5.6 variation. It required 4 pieces of gear. There is various webbing tied to a tree at the top which you can use for an anchor. BEWARE: as I was cleaning the route, I stepped on a 2′ x 2′ boulder which completely gave way. The rock here is very porous. Actually it’s worse than that, it is disintegrating. 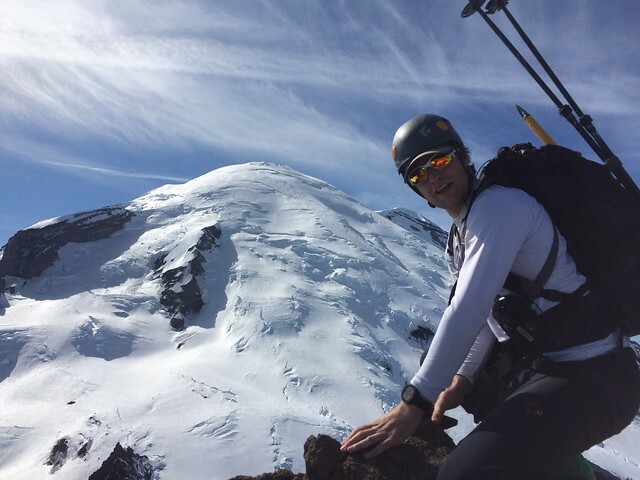 We topped out at 2:00 PM, took some pics of Rainier behind our athletic, sculpted bodies, and rappelled down to the skis. We skied the line we came up on and it was gorgeous. 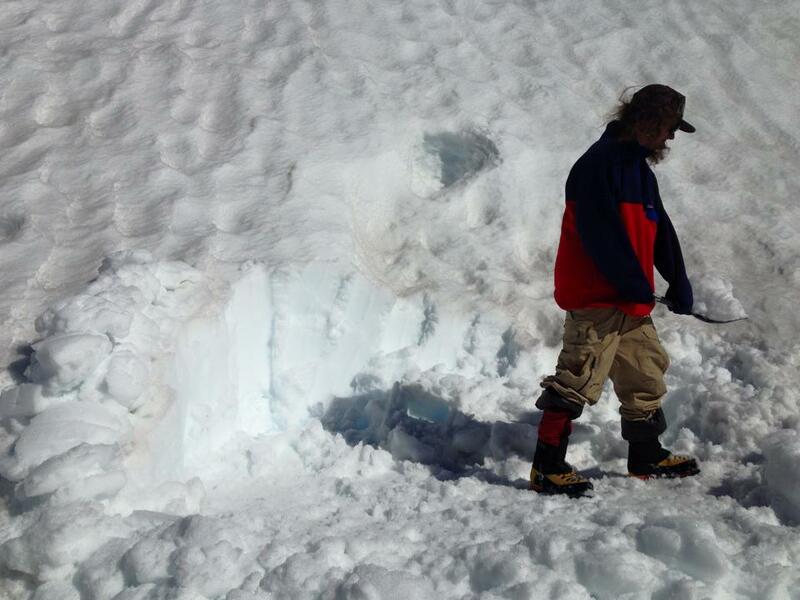 Soft, carvable corned snow all the way back to Snow Lake where we put the skins back on and made haste for the car. All in all, a great day with great company, dilemmas be damned. The forecast was looking promising going into the weekend with a cooling trend moving into Saturday afternoon and lots of precipitation. But we showed up in the parking lot at Chinook Pass a little before 10am on Sunday and it seemed most of that weather didn’t come through. Despite the absence of new snow, we are just excited to be back snowboarding in the mountains again. There is enough snow to cover most of the major obstacles and make for a fairly non confrontational skin out to the east facing bowl below Naches Peak. It is still pretty low tide with some tricky turns to navigate down both the east and west facing slopes. 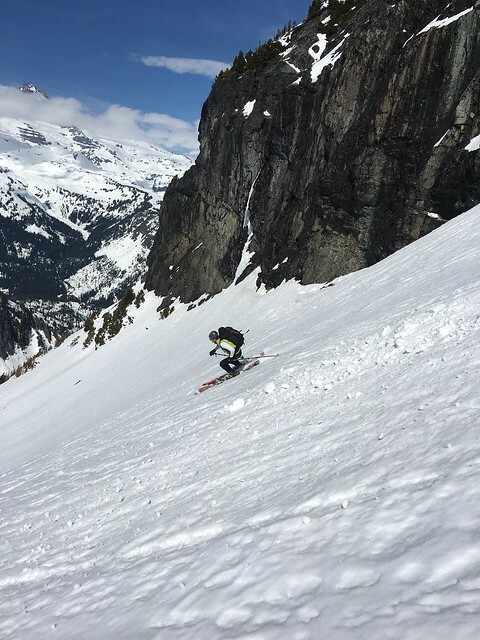 Most turns result in a dirt slash or worse when there are rocks under foot but there’s enough snow to get down the mountain and even get a few fun blasts in when you find that good pocket. It needs another foot to really get going out there, but with a big storm forecasted to come in this week it could be nice real soon. Fingers crossed we don’t get stood up again. Tagged Mt. 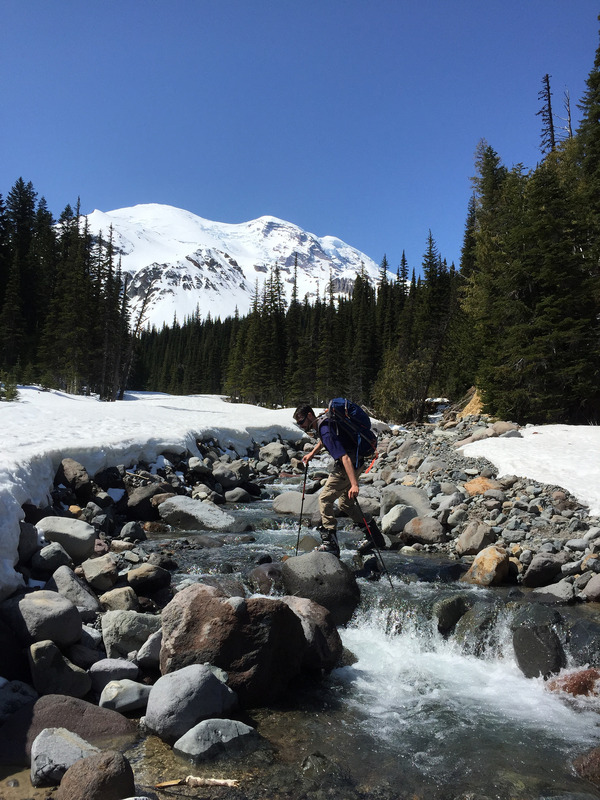 Rainier, Naches Peak, Chinook Pass. It’s hard to get things on the first try, especially in climbing. That’s kind of the allure of the sport when the difficult routes, and less technical ones, can have similar success rates when conditions and other factors don’t line up. For me, Baker, Stuart, and The Brothers have all been failed first attempts. 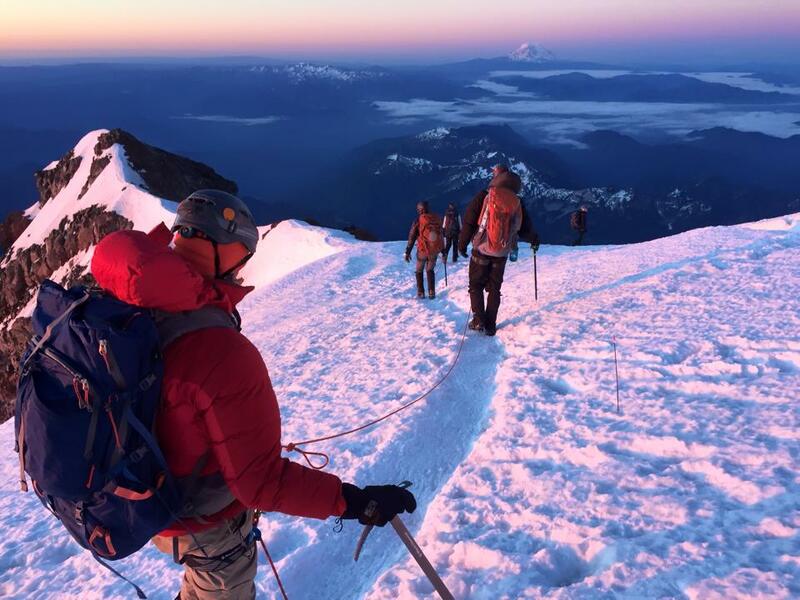 As it turned out on Saturday I kept this streak in tact by not summiting Rainier. 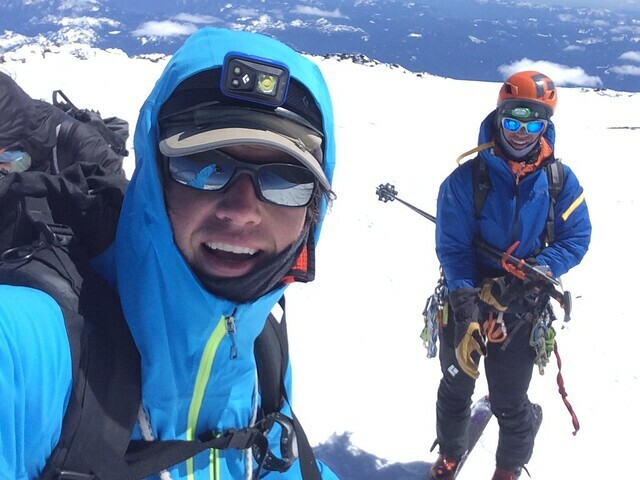 John, Micah and I started off on Friday morning from Paradise amid a thick fog and a full on search and rescue for a missing climber on the upper mountain, making it difficult to acquire climbing permits, as all hands were on deck for the search. A couple trips back and forth between Paradise and Longmire and we were three climbing permits richer, and set off about 930 am. Snow started just below Panorama Point, and if you’re looking to ski on the Muir Snowfield anytime soon the snow is continuos by the time you get to the top, around 7000 ft. Between 8000 and 8400 ft we finally broke out of the clouds to a warm and sunny day on the mountain. 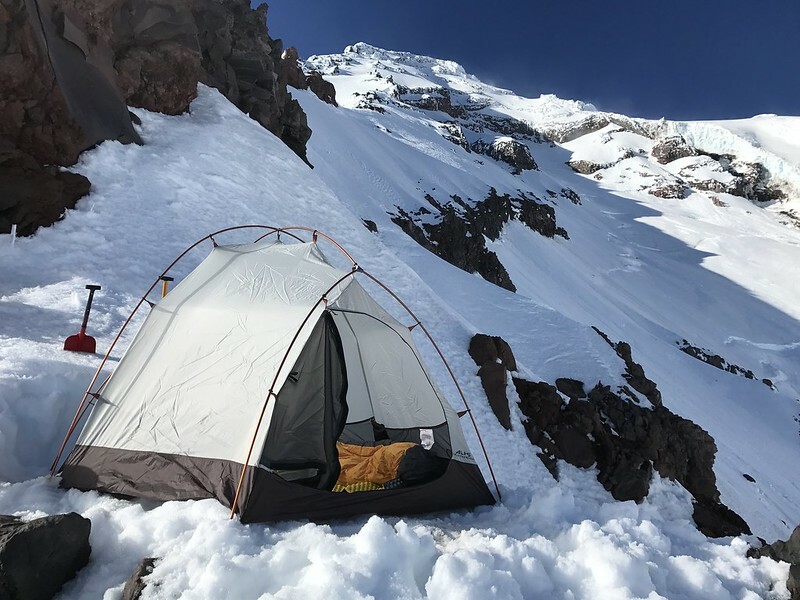 We took our time getting to Muir stopping first for a long lunch and later to shed layers and just generally enjoy the scenery, showing up at camp around 300pm. Anticipating high winds on Friday evening, we spent some time digging a pit for the tent and I was calling it a night by 730 pm. The wind did turn up at night but we stayed fairly warm. At 1130 pm we got up, anchored the tent, and were going by 1230 am. It was a super nice night, clear and a little cold. 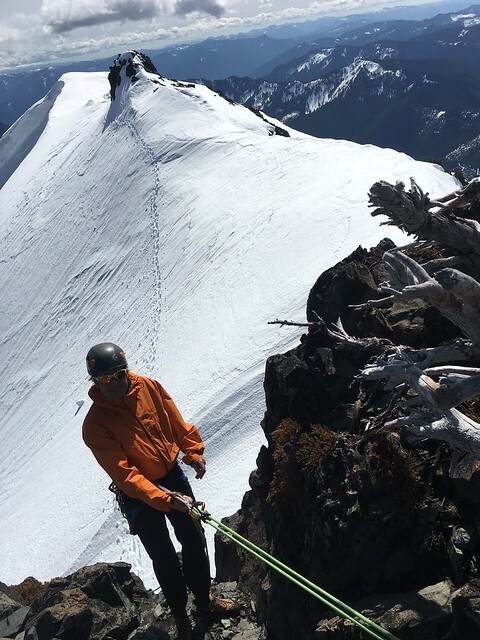 I was struggling to keep my harness tight around my waist most of the way up, so at Ingraham Flats we stopped for the first of many times so I could re-adjust it. From there the snow started to break up and just below the cleaver a ladder had been set to cross one of the wider holes in the snow. We went up the Cleaver and at 12500ft we started cutting over to Gibralter Rock, crossing a second ladder and then a fixed rope for about 150 yrds. 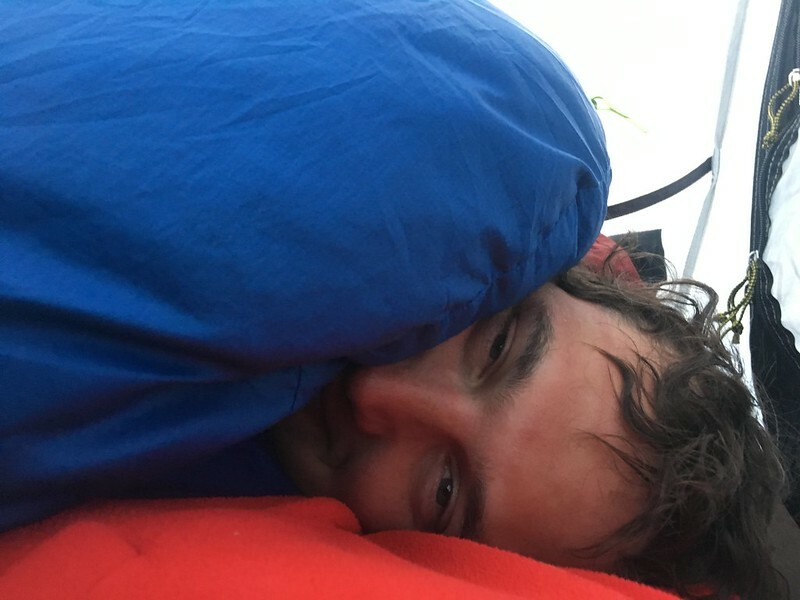 The sun was starting to come up now and I was starting to feel the altitude kick in, causing me to slow down significantly. From Gibralter Rock we went straight up the mountain, stopping at 700 am around 13400 when the altitude really started messing with my head. I decided that was enough for the day and any further was going to be a sad time for me. The day was getting nice at this point and as hard as it was to keep going, it was almost harder to turn around. When you get a window where the conditions line up as they did, it is a shame not to capitalize on it but such is life at elevation. The snow on the mountain is really breaking up now so there are a lot of cool formations on a huge scale. We followed our same route back down to basecamp and after a short break packed up and headed back to the car. 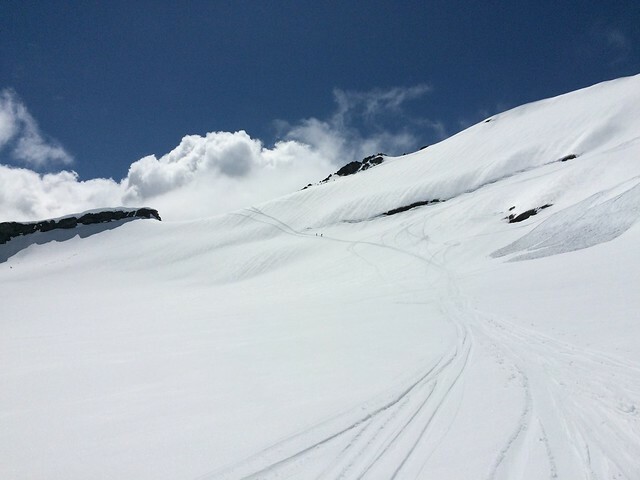 Typically these trip reports are reserved skiing but as we are in full on summer mode now, the touring set up for this trip seemed like it would be bulky and the turns seemed like they would be slow. 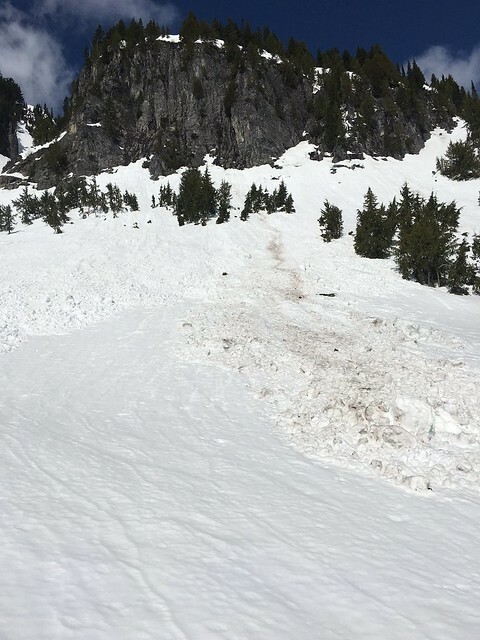 We did see some folks still skiing the Nisqually Chute though, which is still continuos from the top but turns into a bit of a white ribbon down low. 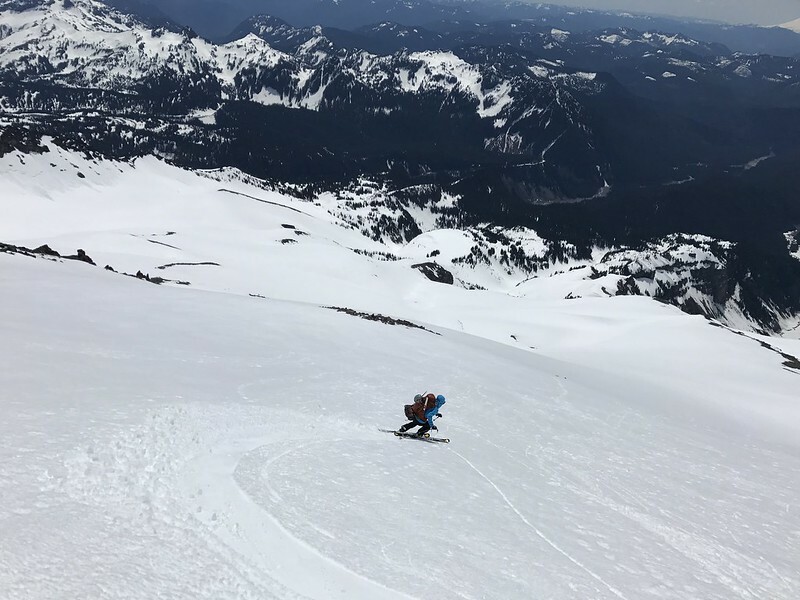 So no skiing, no summit but it was no problem, because I think we all had a fun time and for my first time on the upper mountain at Rainier it was great, still it would have been nice to get it on the first try. Two peaks in one week?! What a treat. 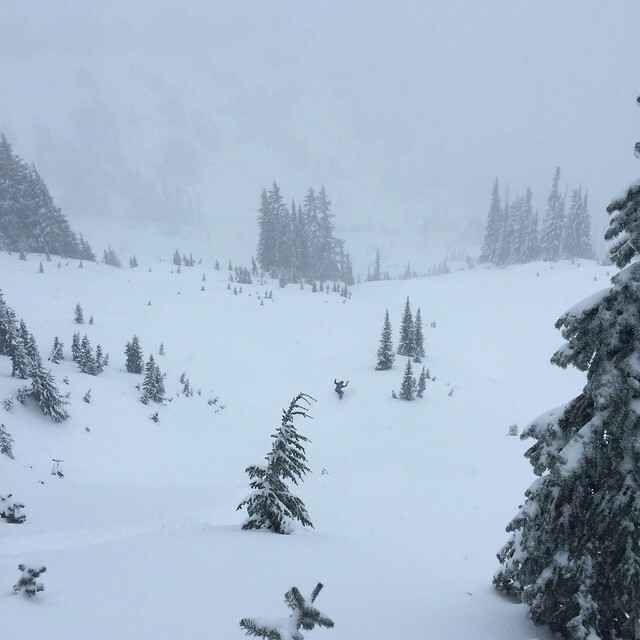 A late winter storm hit this weekend leaving over two feet of snow in the mountains in 48 hours, remarkably Stevens Pass started spinning the lifts for a day. A few of us chose a different pass to ski on Sunday. For the second time in two weeks we set off from Chinook Pass around 10 this morning to join roughly 100 other folks on the hills around Naches Peak. The late start was no problem, as there were plenty of good turns to go around. It seems 75% of the crowd generally clears out by 11:30 up there, so by noon we were skiing the thigh deeps turns by ourselves. The new snow was bonding to the layer below extremely well and we saw little to no activity, even in the steeper terrain. Bottomless and stable, truly hero snow today. On the way out we skied a new route off the west side of Naches back to the car. It is ridden just as much as the east side but it was new to me, and makes the trip out much more enjoyable. The snow is good out there right now, and it looks like there may be a bit more on the way. How nice is it that they opened the pass so early? If it keeps snowing like this they may close it down again. Get it while it’s hot cold! It was a relatively quiet day at Paradise when we showed up in the parking lot. Despite the few visitors to the park on a Friday though, the skin track was well worn as far as Panorama Point. No doubt the powder starved masses trying to cash in on the most recent late season storm from last week. 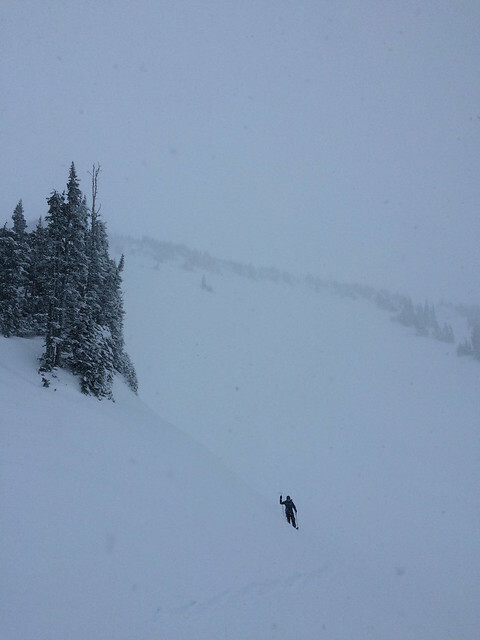 The new snow seemed well bonded now with the notable exception of some major movement down the Nisqually Chute. I didn’t hear when that occurred but the snow in the slide was set up pretty firm, when we eventually rode down on top of it. It was ultimately a fairly uneventful day riding the the Chute. We split to around 8500 and dropped in on a slightly lower aspect. Pretty windy today, especially about 6000. The snow was very blown up top but started to soften around 7000 on the way down and back to the parking lot. With some significant snow in the forecast for tonight and through the weekend it seems it could get treacherous on some of the higher angle slopes in the next couple of days. I for one however, welcome some new snow in the mountains. Tagged Mt. Rainier, Nisqually Chute.